Bring a large pot of water to a boil, salt it, add the pasta and cook to just shy of al dente, about 7 minutes. Drain. While the pasta is working, in a large, deep skillet with a tight-fitting lid, heat the EVOO, two turns of the pan, over medium-high heat. Crumble in the sausage and cook until browned, about 5 minutes. Add the celery, onion, garlic, fennel seeds and bay leaf and cook until softened, about 5 minutes. Add the tomatoes, cover, increase the heat to high and cook until they burst, about 5 minutes. Lower the heat to medium-high and pour in the vermouth, scraping the bottom of the pan. Stir in the parsley, season with pepper and add the mussels. Cover the pan and cook until the mussels open, about 2 minutes (discard any that do not open). Add the pasta and toss to combine. Let stand for 2 minutes, then gently toss again and serve. In Recipes-list.com we have selected the most viewed recipes from category - uncategorized . Enjoy the best recipes specially selected for you! 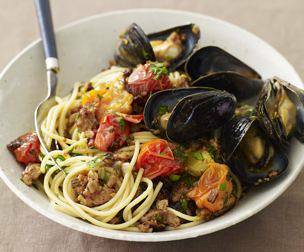 Sausage-and-Mussel Spaghetti is the right choice that will satisfy all your claims.